Confession time… this is my third attempt for turning my seemingly good idea at the time into something really good. Normally, I get an idea in my head, run with it, and the end result, I’d say 80% of the time is what I was expected. Sometimes it is even better, other times… well.. how can I put it without sounding too critical… was ‘okay’. My brain is wired quite simply. I think… ‘what do I like?’ and the rest is an adaptation of one form or another. I really like good bread. I also love savoury bread. Finally, I like to try making new things I have not experienced before. That is my process. I am more than happy to explain what went wrong with previous recipes, just so you don’t have to repeat the same mistake. There was nothing wrong in my choice of ingredients, just how I chose to incorporate them. Oh, and timings. So, in case you think I am off my rocker, Herbes de Provence, Red chilli, black olives, and red and white onions work really well. What does not though is: shoving them into the dough too soon, or without drying out the red onions and chilli first. My final lesson learned – proving dough in Autumn is not the same to proving dough in Summer. The ambient temperature makes all the difference. This being the case, my approach had changed marginally – my kitchen’s room temperature (around 18C at the moment) is not sufficient – I have found a new home for proving – my storage cupboard which contains hot water tank and boiler. The temp? 23C-28C (depending on if the boiler has been running) – and where proving is concerned, what a difference. 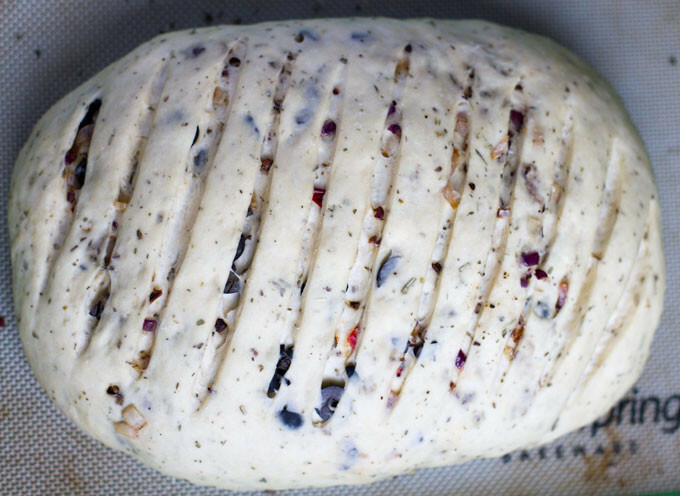 Right, for anyone who has managed to make it, I hope you really enjoy my recipe for Onion, Red Chilli, and Black Olive Bread with Herbes de Provence. Personally, I like it as it is – just warmed up with a drizzle of olive oil. Combine all the dry ingredients (flour, yeast, salt, Herbes de Provence and sugar) in a large mixing bowl, and mix thoroughly using a bell whisk. In a measuring jug, add hot (from the tap) water to the 275ml line. Next, add 3 tbsp of olive oil to the mixture and stir thoroughly. Then, create a well in the middle of the mixture and slowly pour about one-half of the liquid. Using a silicone spatula or wooden spoon, start to fold the dry ingredients into the liquid. Then, gradually add the liquid, and keep folding together until a dough ball is formed. You may at this stage find it easier to switch your your hands, or a hybrid hand and utensil approach which means that the dry and wet ingredients are being evenly distributed. Remove the dough from the mixing bowl, and knead for 5 minutes or so until the texture is no longer sticky, yet still elastic. You may need to sprinkle additional flour during this process, so keep some at hand. I use a silicone baking mat to knead on. Oil the same mixing bowl (saves washing up) with a small amount of olive oil, then return kneaded dough ball, cover with a tea towel or cling film for 1 hour, and allow to rise in a warm place. As I mentioned earlier, room temperature is no longer sufficient - I have found an alternative and consistently warmer location. Whilst the bread is proving for the first hour, it is time to prepare the other ingredients. Line and lightly grease a baking tray with kitchen foil, and preheat the oven to 170C. Then finely dice the red and white onions, and spread out on the baking tray. De-seed the red chilli, finely slice, and mix together with the onion. Drizzle over a little olive oil, balsamic vinegar, and season to taste. Bake in the oven for about 20 mins- stirring half way through. Once cooked (the onion will start to crisp) remove from oven to cool down. Meanwhile, drain the black olives and finely slice into rings. Remove excess moisture using kitchen paper. The dough should have doubled in size (maybe a little more). Remove the dough and flatten into a large oval. Then, evenly sprinkle the onions, chilli, and olives over the flattened loaf. Optionally, and to maintain a softer crust, pour 2 x cups of water into a tall-sided baking tray and put this in the bottom of the oven. As the oven heats up, as will the water. The purpose is to create a gentle steam, which in turn will result in a softer crust. It is one thing for me to cobble my own recipes and claim how good I think they are – it is another to have one of the followers of Love the kitchen get in touch and have a go making one themselves. Earlier this week, Tersia Bekker from Mozambique got in touch even before this bread had made it to the oven. I though as a new addition, why not hear someone else’s experience. I was really thrilled when Tersia shared the following story with me, complete with photos. I would be more than happy to have this as a regular feature. I am teaching here in Mozambique and the learners are writing exams now, thus from the minute I walk in at home to bedtime, I am marking, marking,marking! The bread was absolutely divine…as you can gather from photo’s three and four (it was only my husband and I that did “verslind” the bread, together with pork and salad, in one sitting!! We sprinkled a bit of finely chopped garlic on top. The recipe works wonderful and we found that everything, e.g. the rising of the dough, happens as described in the recipe. On Monday he only left me with three slices and the rest of what was left…guess…in his lunch tin! I One of the learners in my class, asks daily: “Mam, what are you having for lunch today?” (and usually his two friends are all ears to hear my answer) Well, I told and showed this divine bread to them…then offered them some, whereupon, they said that they don’t want to eat my lunch as I will go hungry. I assured them that I will survive should they leave me one slice, then left the class to fetch tea. Returning to class, there wasn’t a crumb left! They now want to visit me so that I can bake them one as I am such an excellent baker!! “Yip,” I replied “we’ll do that BUT I am not going to bake it, I will teach YOU how to bake it!” We will be doing just that during the coming holidays. WOW, this sounds and looks so delicious!! 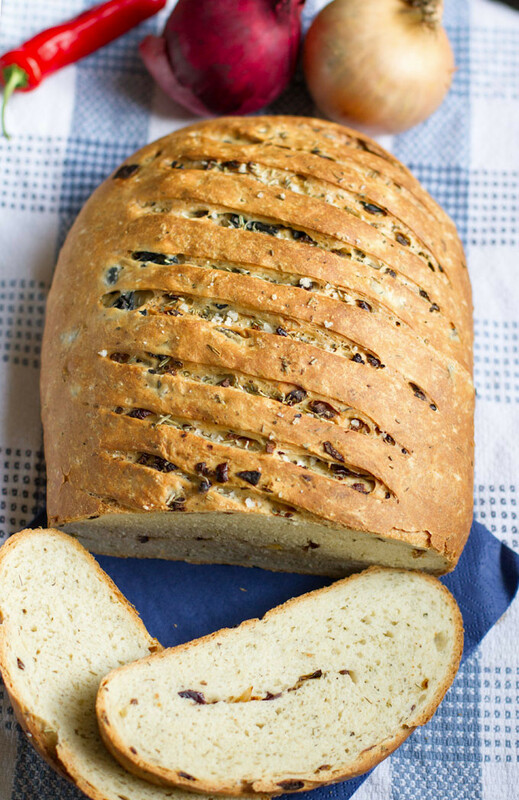 It’s been a while since I made bread… I will definitely be trying this out! Found you on FBP, by the way, and your photos are looking great! thanks for your kind words. Do let me know how you get on with the recipe. I find making bread to be one of the most therapeutic things. I’d love to see any adaptations/improvements too. My husband and I am now putting this bread into the oven. So far….it looks divine!! 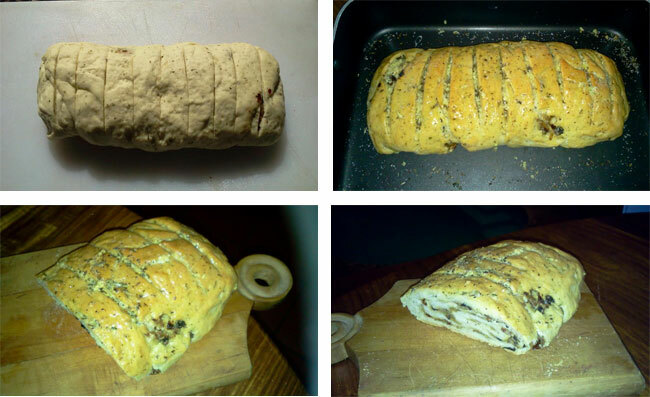 Is there any way that I can send a photograph when it comes out of the oven? Please email me at: hello@lovethekitchen.co.uk and I will will extend my post to include your photo, and any other comments you wish to add. I had the opportunity to try this ‘artisan’ bread last weekend. I am generally not a big fan of bread BUT this bread is amazingly good! Full of flavour. One doesn’t need to have spread on this bread, it’s already delicious on its own. But if you must, toast the bread, add goats cheese and a bit of tapenade…. Yummie!